SINALOA, Mexico — For the first time in the history of Festival Internacional Cervantino (FIC), the state of Sinaloa will participate as guest of honor together with Austria, Poland and Switzerland at the Festival to be held in Guanajuato from 3-12 October. The official presentation of this year’s 40th edition of the Festival took place Tuesday in the Palace of Fine Arts in Mexico City, and later that evening in Guanajuato. 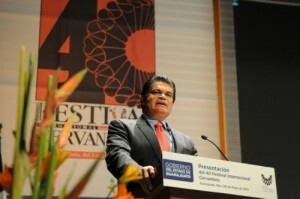 In his ceremonial speech, Sinaloa Governor Mario Lopez Valdez noted that Festival will be a great opportunity to show the world the true face of Sinaloa, one of artistic and cultural supremacy, at the most well-regarded multi-disciplinary cultural festival in Latin America, and among the top five in the world. Guests will see and hear the best of Sinaloa, including Ines Arredondo, Gilberto Owen’s poems, Jose Limon’s dance, and the young and adult symphonies of Sinaloa. Festival Internacional Cervantino, known as “El Cervantino,” is a three-week festival in Guanajuato featuring 500 artists through a variety of art exhibitions, academic events, and many genres of dance and musical performances. Each year FIC invites one Mexican state whose thriving art and culture scene stands out country-wide. The Sinaloa Institute of Culture, ISIC, is working with the FIC to drive the festival’s programming, featuring fifteen local dance, music and theatrical groups and companies, including Banda El Recodo, Banda El Limon, Sinaloa Symphony Orchestra of the Arts (OSSLA) and its director Gordon Campbell, Delphi, Sinaloa Folkloric Company, and more. 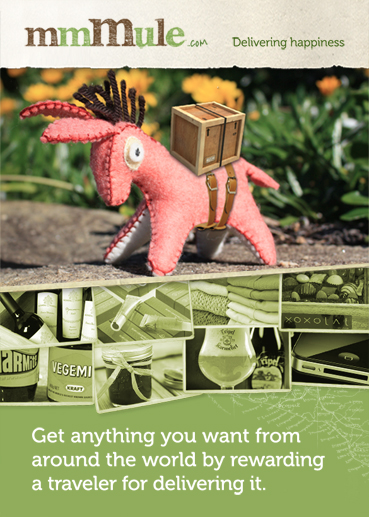 Be a Mule on your travels and get rewarded with great local experiences! New start-up site, mmMule.com, allows people to get anything they want from anywhere in the world by rewarding a traveller with an experience – like drinks in a cool local bar – for delivering it. “We realised it was a common problem as we kept seeing posts on Facebook from friends of all different nationalities who wanted stuff – like food, cosmetics and electronics – that they couldn’t get shipped to where they lived” Avis continues. “We thought that if we could connect locals who wanted stuff with travellers who want more authentic experiences, we could solve a real problem for both, and that’s how mmMule was born”. One of the biggest surprises for mmMule’s founders Andrew, Avis and Alan the response they got when they soft-launched the site. Without any press coverage and just a little social-media seeding, the idea quickly spread around the world. Some of the more unusual requests and rewards on mmMule include one from Joe, who runs a surf camp in France. He wants English bacon delivered from the UK; in return he’s offering his Mule free accommodation and surf lessons. Then there’s Keeli from NYC, who wants a brightly coloured blanket from Guatemala; in return she is offering a few drinks at her favourite little bar. Also Steven in Kazakhstan wants good quality coffee beans so in return he’ll put his Mule up for a few nights. And Henni in Canada who wants ‘real’ toilet paper from Germany; in return she’ll show her Mule around Toronto. mmMule also has a part of its site, AngelMule, dedicated to helping the less fortunate. By becoming an AngelMule travellers can now use part of their travels to deliver urgently needed supplies – like clothing, food, sporting goods or used electronics – to organizations in need. Today’s post is by a long time friend of Mexico Premiere, Jane Custer. Jane and her husband, Greg, founded Destination Ventures 20 years ago and lead the charge in the world of travel agent education. Their “Magic of Mexico” seminars became famous worldwide and they rode their successful wave into the e-learning universe. In 2011, DV was acquired by Mark Murphy and his Travalliance (formerly Performance Media Group LLC). Leaders in agent education and technological innovation, Travalliance implements programs and platforms to enhance the current Specialist programs created by Destination Ventures. We thank you for your contribution, Jane! And, thank you Greg, and Travalliance for all you do for Mexico! Walking through Guadalajara’s open-air antiques market “El Trocadero” on a recent Sunday, I happened across a 1990 issue of Architectural Digest with Isabel Goldsmith-Patiño’s Las Alamandas, on the cover. I took it as I sign. My husband and I had just driven from Puerto Vallarta to Guadalajara via Jalisco’s lush, tropical, elusive, Costalegre. I knew it was time to do some research and refresh my history of this European enclave. Just south of Puerto Vallarta, along the coast of Jalisco state, the mountains, and lush jungle foliage, are spectacularly beautiful and relatively undeveloped. 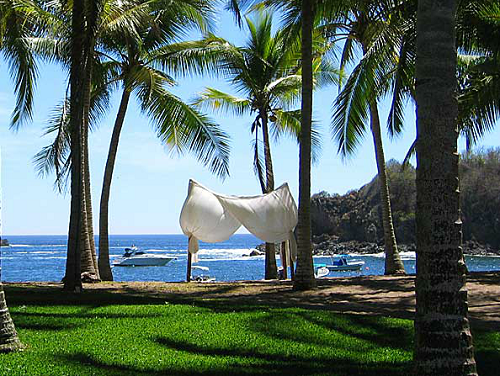 This area called Costalegre (or Happy Coast), comprises a 280 kilometer (174 mile) stretch of coast between Playa Mismaloya and Bahia de Navidad. Huddled between mountains and rocky outcroppings, the golden sand beaches hug coves. The highway, completed in 1973, cuts through mango, papaya, banana and coconut plantations and is crossed by numerous side roads that meander west to hidden beaches, bays, lagoons, and tiny fishing villages. The Blue Bay Los Angeles Locos in Tenacatita is the only chain hotel on the entire Costalegre. To answer this question you need to understand a bit of history. The Bolivian mining millionaire, Antenor Patiño and Maria Cristina de Borbón, a descendant of Spanish royalty, were married in France in 1931 (she at the young age of 17 and he was 35). They had two daughters, Maria Cristina in 1932 and Maria Isabel in 1935. The younger of the Patiños’ two daughters, Maria Isabel, followed a path similar to her mother. At 19 she became pregnant and married Anglo-French financier James Goldsmith. He was 20; she was 19. In 1954, at seven months pregnant, Maria Isabel died of a cerebral hemorrhage. The infant, Isabel Goldsmith Patiño, was born via Caesarian section and was raised by her father, Sir James. After trying for years to obtain a divorce from Maria Cristina de Borbón, Antenor Patiño decided to move to Mexico, a country he had never visited. 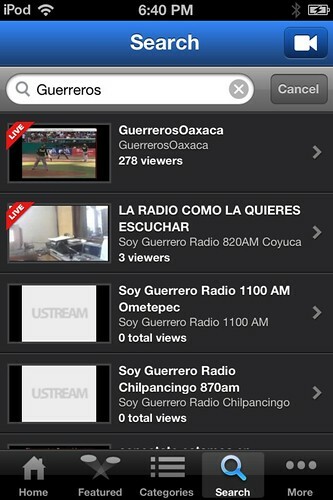 Why Mexico? In exchange for a Mexican divorce, Patiño promised then-president Ruiz Cortines, he would invest heavily in Mexican real estate. According to Mexican writer Carlos Tello Diaz, “The marriage was one of convenience, and their long, litigious divorce, will go down in the annals of International divorce law.” Maria Cristina wrote to President Ruiz-Cortines, and begged him not to grant the divorce. In spite of this, in 1957, the divorce was finalized. Patiño kept his word by building what is still the largest hotel in Mexico City, the Maria Isabel Sheraton, named in honor of his late daughter Maria Isabel. 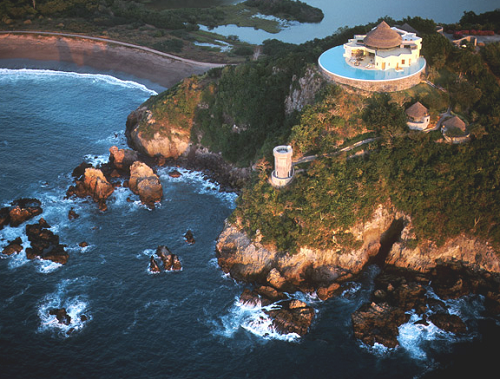 He then began construction on what would become one of the Pacific’s most iconic resorts, Las Hadas. In 1960 Mr. Patiño was married for the second time. He and his wife, Spaniard Beatriz de Rivera, chose to live in Mexico. Beatriz de la Rivera’s niece was married to Italian Banker and world traveler Gian Franco Brignone. After experiencing the beauty of Jalisco’s coastline for himself, Brignone decided to purchase 400 hectares (988 acres) of mangrove and jungle including over seven miles of Pacific coves and beaches in Careyes. Word of Mexico’s Pacific Coastal beauty eventually reached Sir James Goldsmith. In the 1980’s Sir James purchased 9,000 hectares (over 22,000 acres) of land including the Hacienda San Antonio near Colima City all the way to Cuixmala, on the coast. But in 1990, Sir James had a “rebirth” of sorts. The man who was the inspiration for the character of the corporate raider, Sir Larry Wildman, in Oliver Stone’s Wall Street, decided to leave his business persona behind and dedicate his considerable wealth and energy toward furthering the debate on environmental and humanitarianism causes. Due in part to the Sir James’ efforts, and those of daughters Alix, Isabel, and the Brignone family, in 1993, 32,000 acres of the Costalegre were declared a protected area and named the Chamela-Cuixmala Biosphere Reserve. Isabel Goldsmith’s Las Alamandas, Gian Franco and Giorgio Brignone’s Costa Careyes, the villas at Cuixmala, and the spectacular Hacienda San Antonio, are the legacy to be enjoyed by all of us. There are private airstrips, a Polo Field frequented by European Royalty, and a very small human footprint. Not everyone can afford to stay at these exclusive properties, but everyone can enjoy the spectacular, natural scenery, and the history that conspired to save it. Here are some links for those who want try out some of top rate beauty: www.lasalamandas.com – http://www.careyes.com.mx – www.cuixmala.com. Note: there are only 54 hotels, and 1,212 hotel rooms in the entire 174 mile stretch. By comparison the Riviera Maya stretches 100 miles and offers 40,000 hotel rooms. 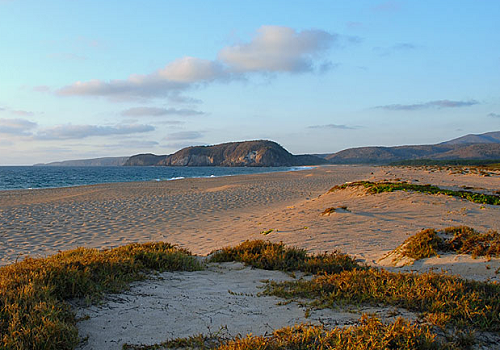 Of the 1,212 rooms 1,094 of them are located south of the Chamela-Cuixmala Biosphere Reserve, on the final 70 miles of Jalisco’s coastline. The “European enclave” I have written about offers 118 rooms in the form of deluxe bungalows, homes, villas, and castles, along 100 miles of coast.